Showing in 2010 at 15 yrs of age, competing against mares half her age! RDS Torcasa is our 20 year old HNS Domingo+ daughter & foundation mare. Torcasa is a multiple Regional Champion of Champions Breeding Mare, and Best Gaited Horse of show. 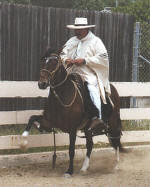 She was the 2001 Medallon de Plata Breeding Mare - high point breeding Mare of North America, for the PPHRNA. Torcasa is a 4 time Champion of Champions Breeding Mare & Best Gaited Horse of Show. She also won multiple championships in the halter division, starting her show career at 2 years of age. A daughter of HNS Domingo, grandaughter of Piloto & Mantequilla, she has some of the most important bloodlines in the breed. After taking a few years off to have foals, Torcasa returned to the show ring recently to compete in the Crystal Classes. She is a fun trail horse too! Dam of multi Champion of Champions Performance Mare KLP Sedona, Multi Champion Bozal & Halter Filly & Medallion de Plata Filly KLP Tentacion, multi Champion Halter Colt & Best Bozal Horse of show KLP Tradicional, & Best Bozal horse of show, CELD Emperadora de Siglo. All of her offpsring that have been shown are Champions in the show ring. Video from The Santa Ynez Peruvian Ranch Tour, August 2011.